If you’ve explored NASA’s website, you may have noticed that What on Earth is just one of a network of NASA blogs. You can find many of them on this main index page, but there are also NASA bloggers scattered at numerous other pages. Earth Observatory’s Notes from the Field focuses, for example, on scientific field campaigns. And NASA’s Climate Change website, which is run by the Jet Propulsion Laboratory (JPL), features a blog called My Big Fat Planet. At Goddard Space Flight Center (GSFC), Geeked on Goddard (aka gogblog), written by a former Astronomy blogger, is fast becoming a go-to-source for all things Goddard (and includes plenty of earth science news). Why bother with aircraft when we can fly spacecraft? Well, airborne missions enable us to do unique — and crucial — experiments in the fields of atmospheric chemistry and volcanology, for example, from altitudes that range from 100 feet (30 meters) to 60,000 feet (18 kilometers). 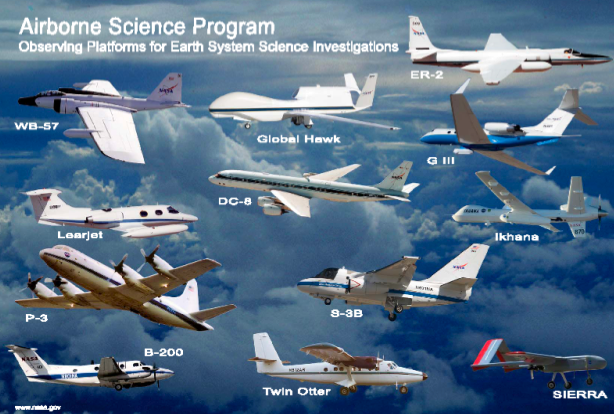 They also help us to check and validate the performance of the instruments that fly onboard NASA satellites such as Aqua, Aura, and others in the so-called “A-train” of Earth-observing satellites. And airborne instruments are often cheaper to launch. Tethered and untethered balloons; manned aircraft ranging from small propeller craft (think Cessna) to large jet engines (think the DC-8 aircraft); unmanned airplanes such as the large surveillance craft known as the Global Hawk — NASA uses them all. You can read the rest of Tony’s post here. What do NASA techies do with their spare time? They make rock-n-roll videos. Not the big-hair, booty-shaking, smoke-and-fire kind. They help make rock videos that would make their daytime colleagues proud or jealous, or both. The rock band OK Go prides itself on creative visual expressions of their music, and they wanted an extra dose of gee-whiz fun for their song “This Too Shall Pass.” In early 2010, the group enlisted the help of Syyn Labs — a self-described “group of creative engineers who twist together art and technology.” The Syyn Labs fraternity included (or ensnared) four staff members from NASA’s Jet Propulsion Laboratory. OK Go requested a Rube Goldberg machine as the centerpiece of a video. To borrow from wikipedia, a “Rube Goldberg machine is a deliberately over-engineered machine that performs a very simple task in a very complex fashion, usually including a chain reaction. The name is drawn from American cartoonist and inventor Rube Goldberg.” Think of the classic board game Mousetrap or your favorite chain reactions from Tom & Jerry cartoons. More than 40 engineers, techies, artists, and circus types spent several months designing, building, rebuilding, and re-setting a machine that took up two floors of a Los Angeles warehouse. The volunteers went to work after work, giving up many nights, weekends, and even some vacation days to build a machine that has drawn more than 13 million views on YouTube. Eldar Noe Dobrea, Ph.D., a planetary scientist working to study landing sites for the upcoming Mars Science Laboratory. What on Earth caught up with these rock-n-roll moonlighters to learn more about the machine and video. What on Earth: What was your role in the creation of the machine, and what was the inspiration behind your piece? Eldar: My main role was to help design and construct the descent stage (2:06 to 2:28 in the video). The inspiration for the rover was a small Japanese Rube Goldberg machine that had a tiny mock-up of a mouse rover, about the size of a Hot Wheels car. It struck me that since I am representing JPL, we should have a Mars Rover in our machine. Chris: I helped finish up the sequence of interactions and the filming. I have a couple things that I was involved with, but cannot take complete ownership of any. But during the filming, I redesigned the beginning dominos (0:06-0:18 sec.) and helped set them up between the numerous takes (60+). Mike: I worked on the tire ramp, mostly focusing on wiring the relay circuits for the lamps that were triggered by the tire. You’ve got to wonder when a mechanical guy does electrical work. A friend from CalTech told me about a band making a music video featuring a Rube-Goldberg machine. Any time I’ve seen one in a movie, like in Pee Wee Herman’s Big Adventure or Chitty Chitty Bang Bang, I’ve always wanted to make one myself. Heather: I helped make sure all the modules came together in the first half of the video. I also worked on the intro, the Lego table, and the inflatables. There were a few guiding principles behind the machine. No magic: Mechanisms should be understandable and built from found objects where possible. Small to big: The size of the modules and parts becomes bigger over the course of the video. One take: As in their other videos, the band wanted the entire piece shot in one piece by a single handheld camera. What on Earth: How many “takes” did it take to get the machine to work? Mike: Before filming, it took more tries to get things right than anyone could ever have counted. Sometimes I’d spend three or four hours just fiddling with one part to get it right. Even then, it often got changed a couple days later to something else. Heather: We learned something very important about physics in the process of making this video. It is much harder to make small things reliable. Temperature, friction, even dust all greatly effect the repeatability and timing of the small stuff. The first minute of the video failed at a rate that was tenfold of the rest of the machine. Remembering that rule about getting everything in one shot — if your module is further down the line in the video, you’re in big trouble if it doesn’t work! The machine took half an hour and 20 people to reset. What on Earth: What’s the funniest or strangest thing that happened on the set? Chris: Realizing that a number of PhDs built one thing and a clown from a circus built another part. There was no hierarchy. Everyone was there for the same purpose: to build a machine that worked and was fun! Mike: I helped assemble the sequence between the piano and the shopping cart (1:34 to 1:41). The tetherball pole was supposed to trigger the shopping cart, but when we played the song, the timing was off. The band wanted more delay so that the cart crashed at the end of ‘when the morning comes.’ I added in a sequence using a director’s chair, a piano cover, a waffle iron, and a 10-pound weight to give the necessary delay. Heather’s shoe became part of the sequence, too. The director’s chair has a rope holding one arm in place. My first thought on holding this rope was to use an umbrella, but Heather told me there were already too many umbrellas in the machine. I rummaged around the warehouse and found a high-heeled shoe sitting around a bunch of junk, and I thought this would make a great holder for the rope. I fastened the shoe to a 2-by-4 with three large wood screws, pried off the rubber tip of the heel, and sanded it a bit to allow the rope to slip off with just the right amount of force. What on Earth: What is your favorite part of the machine? Eldar: I think the beginning, where the ball bearing jumps out of the speaker when the music begins (0:24) is absolute genius. But the guitar hitting the glasses and taking over the music (1:24) is also quite phenomenal in timing and execution. There were so many things in this machine that blew my mind. Heather: There are various ‘Easter eggs’ from the band’s other videos that are nestled within the machine. The most obvious is the treadmill video playing on the TV that gets smashed (2:37). But there are also references to the Notre Dame marching band video on the Lego table (1:17) — from the tall Lego drummer to the dancing grass people (I made those!). Chris: My favorite is the falling piano! That thing took such a beating and was screwed together take after take. It only lasts for a fraction of the video, but it has such comical importance and was triggered after one of the best parts of the video — the clinking glasses. What on Earth: So if you could quit the day job and get paid for such things, would you? Mike: I don’t think so because I really like my day job. And even though working on the video was great fun, if it became a full-time job, I don’t think it would seem as fun anymore. The build seemed like a college frat house at times, and that would definitely go away if it became a job. Eldar: No, I work on missions to other planets! This was fun, but the real deal is at NASA. They say that there is no business like show business. They can keep it. Postscript: If you want to enter the world of music videos – or of the NASA engineer – you can make your own Rube Goldberg machine for the band’s video contest. The newest bird in NASA’s flock — the unmanned Global Hawk — took off at 7 a.m. Pacific time today (April 2) from Dryden Flight Research Center at Edwards Air Force Base in California. The flight is the first airborne checkout of the plane since it was loaded with 11 science instruments for the Global Hawk Pacific (GloPac) mission. Pilots are also streamlining processes to coordinate the workload while the nearly autonomous plane is flying at altitudes above 60,000 feet (almost twice as high as a commercial airliner). Operators and mission researchers are using the day to make sure all instruments are operating properly while in flight — particularly at the cold temperatures of high altitude — and communicating clearly with the plane and ground controllers. Mission participants expect to begin collecting data when actual GloPac science flights begin over the Pacific Ocean later this month. 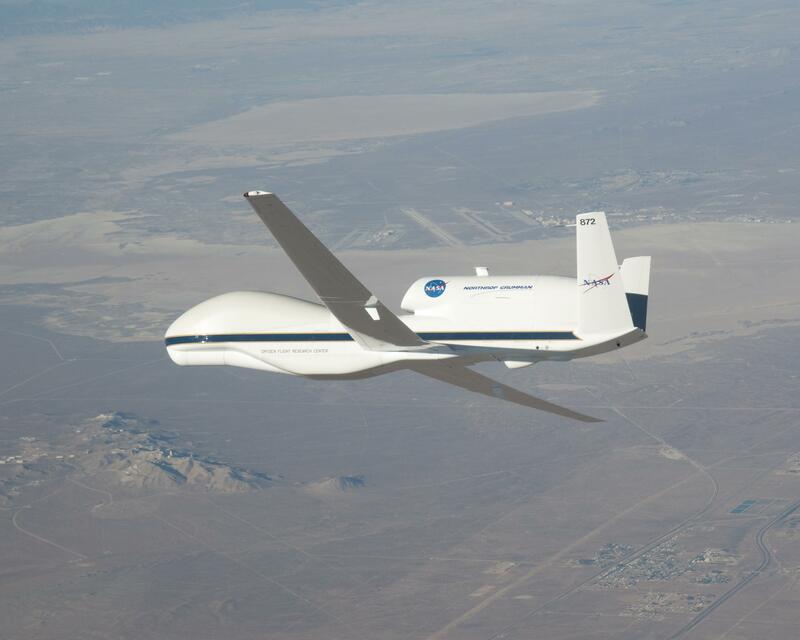 GloPac is the Global Hawk’s first scientific mission. Instruments will sample the chemical composition of air in Earth’s two lowest atmospheric layers — the stratosphere and troposphere — and profile the dynamics and meteorology of both. They also will observe the distribution of clouds and aerosol particles. The instruments are operated by scientists and technicians from seven science institutions and are funded by NASA and the National Oceanic and Atmospheric Administration (NOAA). Even though it’s sometimes convenient to think of the ocean as a great big bathtub, where turning on the tap at one end raises the water level in the whole tub, real sea level rise doesn’t quite happen that way. To understand why, you first have to realize that ‘sea level’ isn’t really level at all. Click here to read the full posting from Josh. And be sure to check out the interactive sea level rise viewer. Sonntag’s observation took place during the 2008 NASA and Center for Remote Sensing of Ice Sheets (CReSIS) airborne deployment in Greenland. This spring, Sonntag and other scientists return to the Arctic for big picture and little picture views of the ice as part of NASA’s six-year Operation Ice Bridge mission — the largest airborne survey of Earth’s polar ice ever flown — now entering its second year. The project team is finalizing flight paths over Greenland’s ice sheet and surrounding sea ice, where scientists will collect measurements, maps and images from a suite of airborne instruments. Such information will help scientists extend the record of changes to the ice previously observed by NASA’s Ice, Cloud, and land Elevation Satellite (ICESat), while uncovering new details about land-water-ice dynamics. NASA aircraft have made numerous science flights over Greenland, most recently during the spring 2009 Ice Bridge campaign and also in 2008 as part of the NASA/CReSIS deployment. Smaller-scale airborne surveys have been made by William Krabill, of NASA Wallops, and colleagues nearly every spring since 1991. Visit the Operation Ice Bridge Web page throughout the spring 2010 campaign for news, images, and updates from the field. 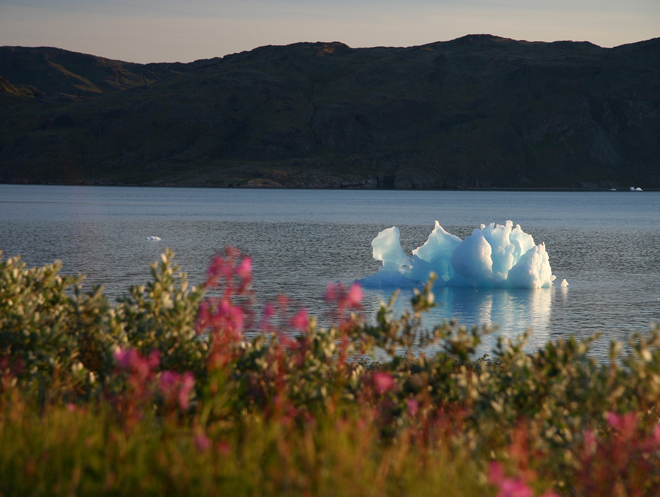 Flights from Greenland are scheduled to begin no sooner than March 22. One-sixth of the world’s population relies on melted snow for their freshwater, which means good estimates of snow are critical for making realistic predictions of a region’s water supply. But measuring snow, especially the amount of water locked within that snow, challenges researchers across the globe. Why? The two means of estimating snow totals—weather modeling and satellite remote sensing—can vary as much as 30 percent. Scientists like hydrologist Edward Kim of NASA’s Goddard Space Flight Center continue to seek ways to reconcile the gap between measurement results. Kim and colleagues Michael Durand (Byrd Polar Research Center), Noah Molotch (Univ. of Colorado), and Steve Margulis (UCLA) are wrapping up a short field campaign to measure snow at the Storm Peak Laboratory, perched atop Colorado’s famed mountain at Steamboat Springs. Their aim is to test and improve the accuracy of satellite-based snow measurements. 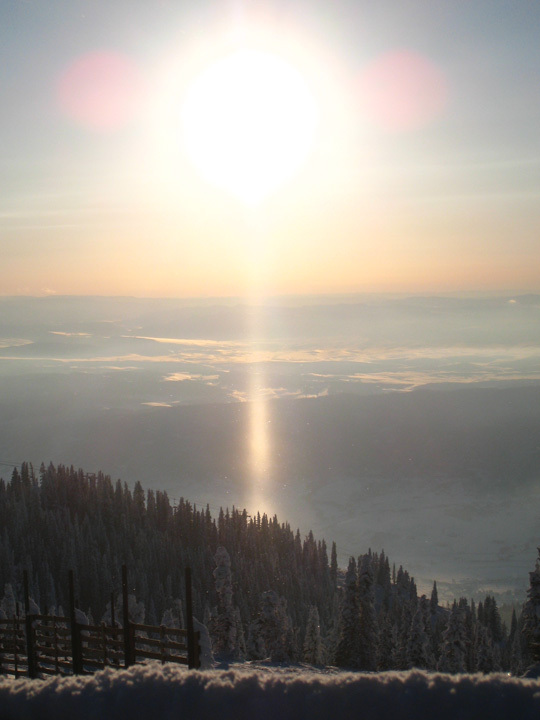 In the midst of the expedition, they’ve also snapped some breathtaking photos, such as this sun pillar to the right. Sun pillars are typically caused by sunlight reflecting off the surfaces of falling ice crystals associated with certain cloud types. 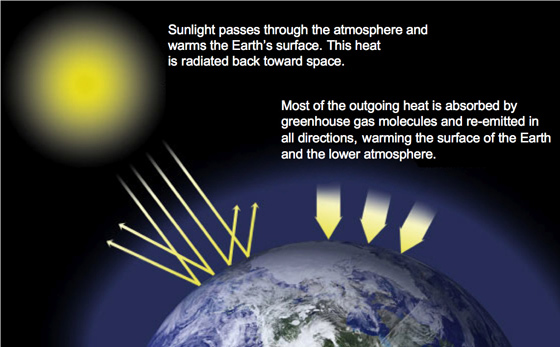 This post was adapted from NASA’s Earth Observatory. For more updates on the expedition, please visit the Notes From the Field blog.